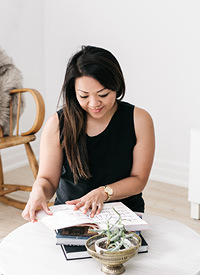 Thrifted Thursday With Mamarazzi — Love On Sunday Love On Sunday | Interior Styling in Toronto and the GTA. So I was thinking the other day, #ThriftedThursday just wouldn't be complete without featuring the person who introduced me to the thrifted life: Mamarazzi. For those of you who know me or have been following my blog since its inception, you will know my Mom is quite the queen of fab finds. She always seems to find something great and if you want solid proof, make sure to check out this post and this post. Where is this piece from? I found this solid wood table at Restore (Habitat). I was so happy to find this piece, the label even reads 'Made in Italy'. This table also came with 2 wooden chairs (which are put away in the garage for now). I thought it was a great find for $150.00. The metal chairs were actually found at a Thrift Store before finding the table and my husband and I realized that the table would be perfect with these two chairs, to complete the set. We decided against using the 2 original wooden chairs in order to create more interest and Amy suggested we reupholster the chairs with something graphic to give the space a more modern feel. But I'm sure I will find some good use for those extra 2 chairs someday soon. The shape of the legs and the size of the table top which was a perfect fit for my banquette; wasn't too small or too big. The craftmanship is quite amazing. The best part is that my 2 chairs can be tucked all the way in, creating a clean look when not in use. What work did you do to give it new life? We stripped the paint off the table top, sanded and stained a darker shade. The original was yellow and I wanted to bring out the natural grain of the wood. We then gave it a coat of clear varnish for protection. It made the grain really shine through and gave a great contrast complementing the black metal legs. How do you use this piece in your home? We use it as a dining table, computer table and my grand kids do their painting here too since they can sit beside each other on the banquette. This table is quite versatile, you can also put it outside on the patio as an extra party table. I'm pretty sure I will be using this table for a long time, and maybe pass it on to the next generation. Excuse my messy hair in this photo, this was taken at my Mom's retirement party. When she's not watching her grandchildren, guess where she's at? The THRIFT STORE. Thanks so much for sharing your fave thrifted find with us, Mom! The banquette was actually designed and built by my Dad and if you haven't already seen the before and after shots, you can check it out here.